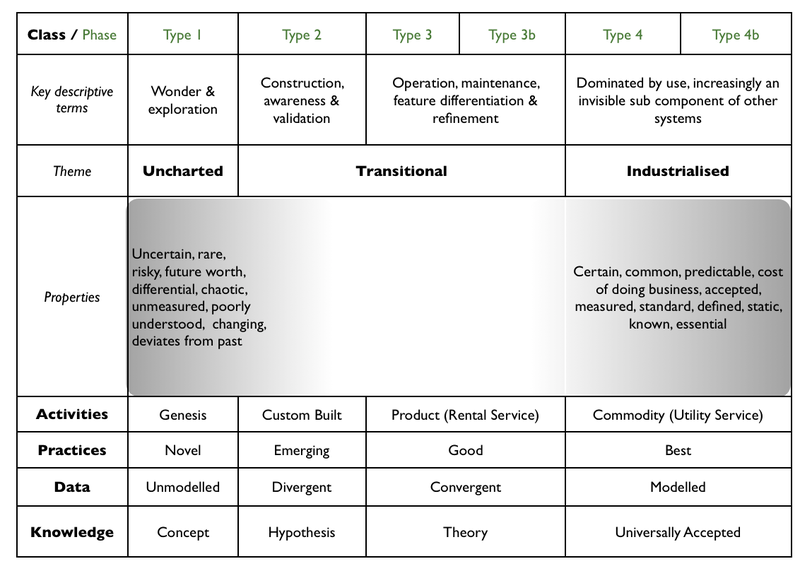 For a long time, I've been using maps of industries, businesses and systems to determine gameplay, management, learning of economic forces and how to manipulate markets. 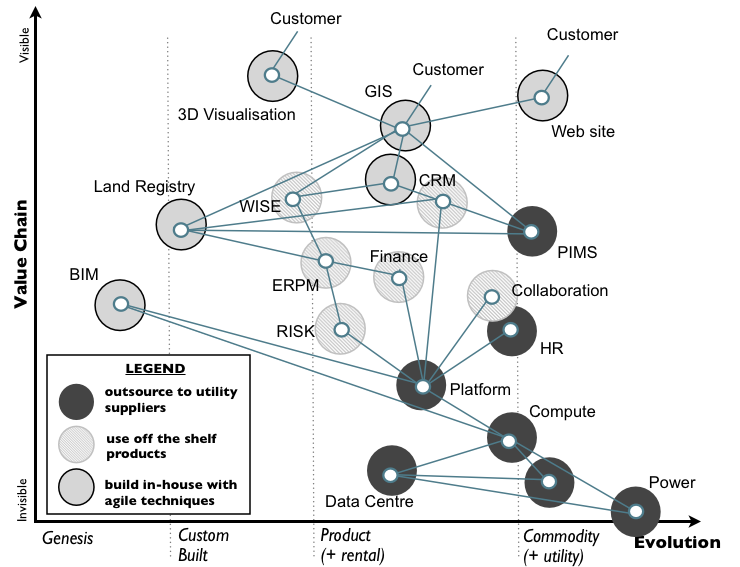 The map has two axis - one of value chain (which represents a recursive set of needs from user needs to supplier needs) and the other of evolution. See figure 1. The first maps I produced were in 2005 and at that time whilst I suspected and had examples of a pattern for evolution (from the genesis of an act to commodity provision) , I actually had no way of describing why it occurred. 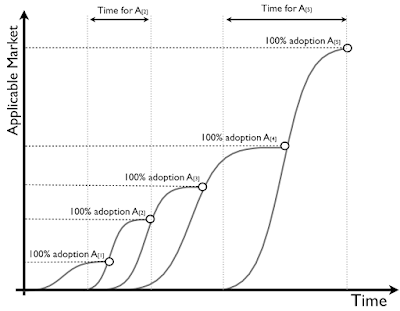 At that time, I was familiar with concepts such as Everett Roger's diffusion curves (adoption over time) but they provided no consistent pattern for change - the diffusion curve of one instance of an activity is not the same as the diffusion curve of another if measured on identical axis. Furthermore an act didn't evolve in a continuous path but instead involved many diffusing instances of more evolved forms e.g. take an activity A then we would see the diffusion of A lead to diffusion of A lead to diffusion of A with each instance being more evolved than the prior. See figure 2. The solution to the problem occurred during a chance set of conversations in which I noticed that whilst people could agree whether something was a commodity when it came to products and something novel (i.e. the genesis of an act) then disagreements abounded. This led me back to the Stacey Matrix (see figure 3, this version is a simplified diagram created by Brenda Zimmerman). 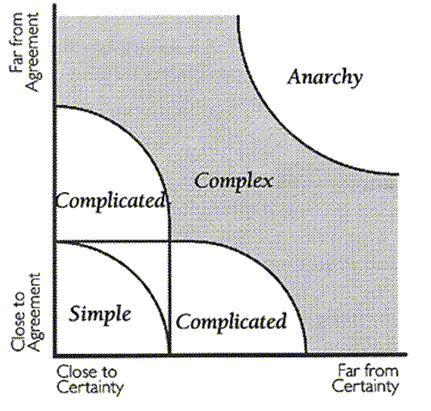 The Stacey Matrix is useful in discussion of how groups agree and what peaked my interest was the use of a certainty axis. This coincided with something Everett Rogers had said that activities evolve through multiple waves of ever improving and more mature examples. A key part of evolution seemed to have something to do with certainty. Hence in 2006 and 2007, I spent a great deal of time trying to determine a measure for certainty for an act. It was by looking in detail at publications of journals and papers on activities that I noted how they changed with time. 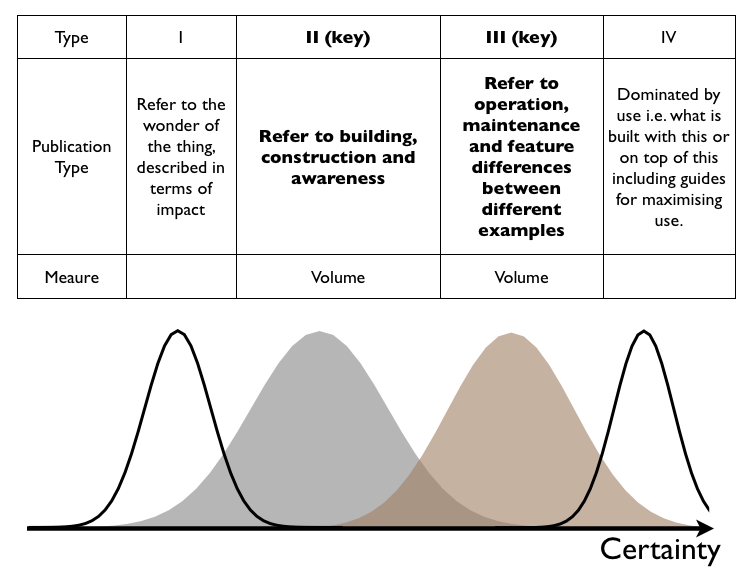 In examining a core set of activities and 9,221 related articles, I was able to categorise the articles into four main types - see figure 4. I then developed a measure of certainty that used the volume of articles of type II and type III produced relative to the total volume of articles when that activity is commonly described as a commodity. I used that reference point (when the activity was commonly described as a commodity) to examine how ubiquitous the act was and then compared past market adoption and publications against this measure. The result was the common pattern shown in figure 5. Now, when examining each of the types of the publication used to manufacture the graph - it became clear that each type of publication was related to a stage of evolution. See figure 6. 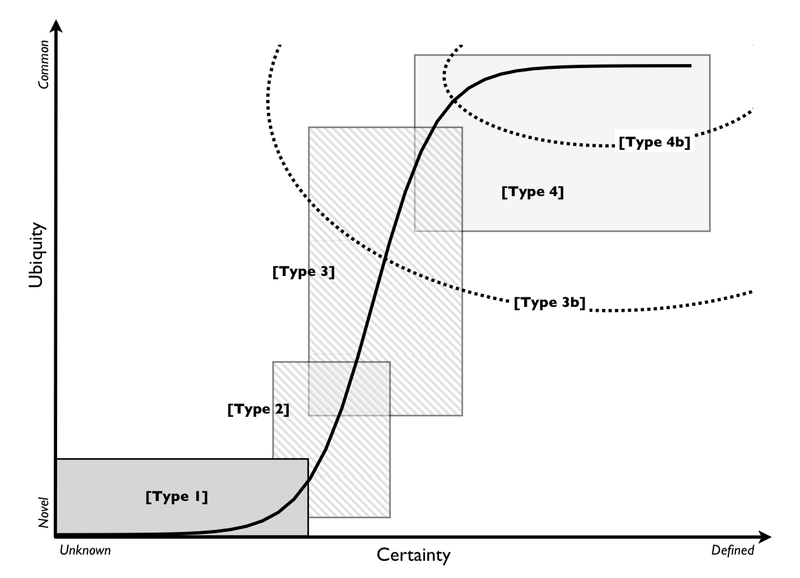 By overlaying the types onto the ubiquity and certainty curve and extrapolating the ends (i.e. when something is novel we have very little information on it), I was able to finally produce in 2007 the evolution curve (see figure 7 below) which demonstrated the pattern which I had used in mapping (see figure 1 at the top). It was shortly after this, I was able to demonstrate the reason why the pattern occurred was simply the interplay between supply and demand competition. . Figure 7 - the evolution curve. I then gave a series of talks on this in late 2007 and early 2008 using the curve to explain the impacts of cloud, 3D printing and highlighting some other common economic patterns e.g. how organisations evolve, how you can exploit ecosystems to manage the future etc. However, as backward as this process sounds it's actually quite normal for a pattern to be 'noticed' and found useful well before any evidence or model demonstrates whether that pattern might exist or is entirely false. In my case mapping was based upon a pattern I noticed (pre 2004), that had proved itself useful (post 2005) and this was well before I had any solid model behind it (2007). It doesn't mean the pattern is right, just that I've yet to find a better one. I'm sure I'll find some examples which break the model at some point in time - though after 7 years, I'm still looking. 1) There is data behind it (thousands of data points) and examples of the pattern are commonplace. However, I haven't published the details of the technique for categorising publications because I'm still using it (for weak signals). Which means, YOU should not trust it. As far as you should be concerned then this evolution curve is only opinion. If you find the pattern useful then use it until something better comes along. The curve has been published in both peer reviewed academic papers and books as a "useful" model. 2) There is consistency in both axis i.e. 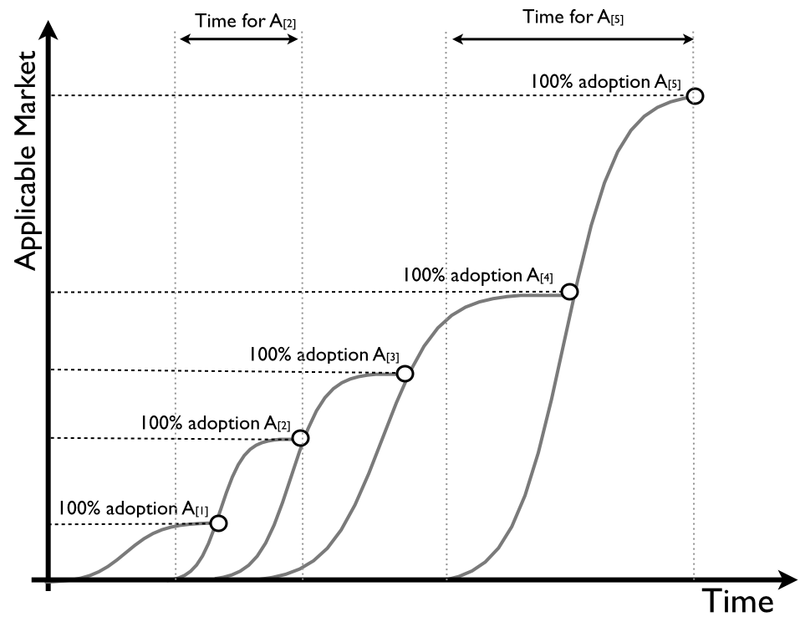 we're not talking adoption curves where the time axis can vary according to the activity in question. 4) It is weakly predictable and I have run predictability tests on this (in particular with the formation of new organisations). 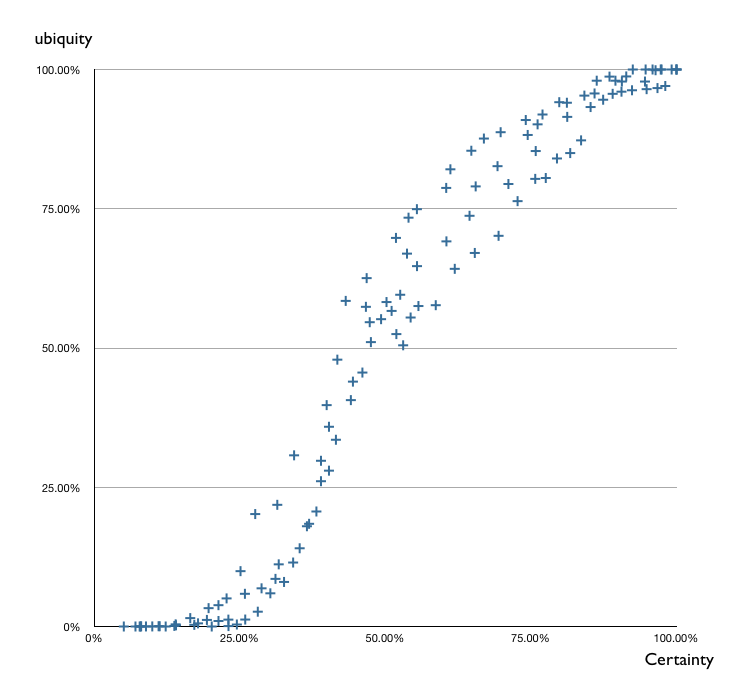 Predictability is the single biggest issue with the evolution curve. In order to create it then I had to remove time but of course, by removing time then it is no longer predictable over it. This is the one bit which makes me feel very uncomfortable with the curve and hence reluctant to publish a book on the subject. Though I find it useful, this is at best a weak hypothesis and I'm still looking for a better way to test / falsify. 5) It is useful or at least it appears to be highly useful as part of the overall map (see figure 1). 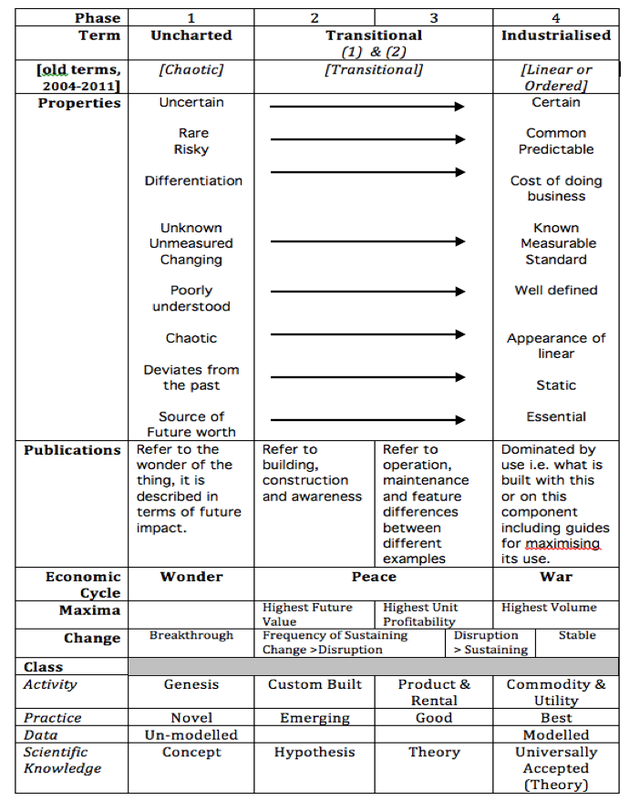 Figure 8 - Different Classes (activities, practice, data and knowledge) evolve through the same property changes. Figure 9 - each of those classes, evolve through the same mechanism. This is why, when we map an environment we can also map - practices, data and types of scientific knowledge along with activities. 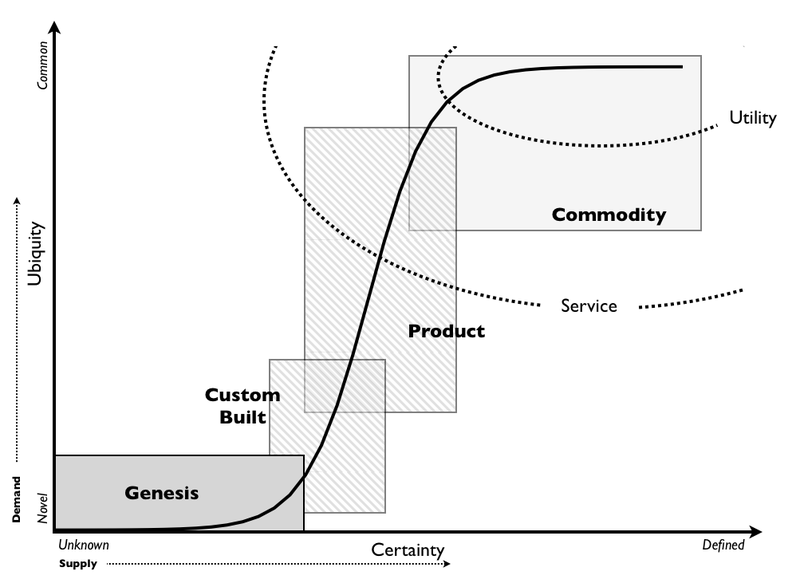 However, as a guide, the bottom axis of a map I tend to describe activities (genesis, custom built, product and commodity) simply because I don't find Type 1 to 4 as meaningful.